Thousands of people are expected at the Genesee Brewery for the lighting of the beloved Keg Tree Friday, December 7. The tree, made of 520 empty Genesee kegs stacked nearly three-stories high and strung with thousands of lights programmed to flash along to holiday songs, has become an annual spectacle that draws people from all over the region to High Falls. Last year, more than double the number of predicted attendees showed up to share in the excitement. According to Mike Gaesser, Keg Tree Creator, the brewery is ready for a big crowd. “Our Keg Tree has become somewhat of a holiday landmark in Rochester, so we know that people are going to come in masses on December 7 to see it lit. That’s why from food and beer to fun, we’re prepared for a huge party,” said Gaesser. 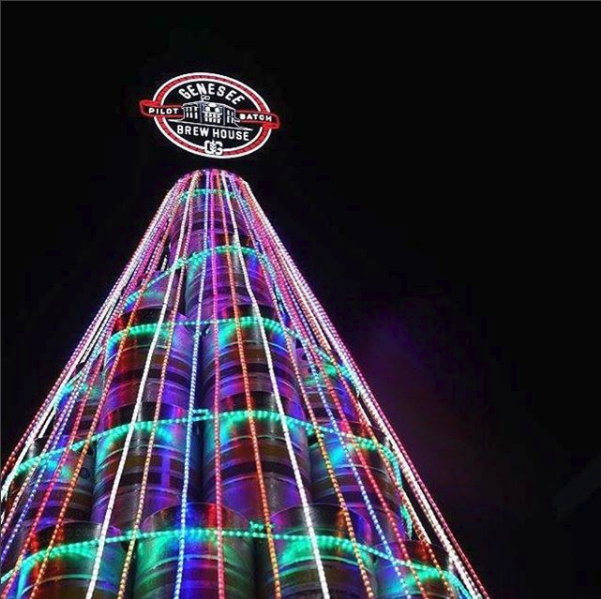 The fifth annual Keg Tree lighting will feature plenty of exciting additions including live music, food trucks, a special-release Keg Tree Ale, a new charitable component and more. The Keg Tree, High Falls Terrace Park, High Falls and the Pont de Rennes bridge will all be twinkling with over 30,000 lights for the party. The annual Keg Tree lights up holiday spirit for all who visit it, and Genesee wants to spread even more cheer by gifting the brewery’s neighbors with their own, handmade decoration. That is why members of Greentopia’s Green Visions program will be at the Keg Tree lighting event handcrafting live wreaths for purchase. For each wreath purchased, one will be donated to a community member to help make their home a little merrier this winter. Genesee Brew House Brewmaster Dean Jones created a festive new brew just for this year’s Keg Tree lighting. Adding a new twist to a Genesee classic, Jones created the Cinnamon Cream Ale. Genesee drinkers can expect the same smooth character and remarkably creamy white head they know and love from the original Cream Ale, with the introduction of a delicious cinnamon flavor. The Keg Tree Ale will debut December 7 and be available on draft and in growlers and crowlers until supplies run out. WHAT: Genesee Brewery’s Keg Tree lighting holiday party. No cost for entry. WHEN: December 7, 2018 from 6-9 p.m., tree lighting at 7 p.m.